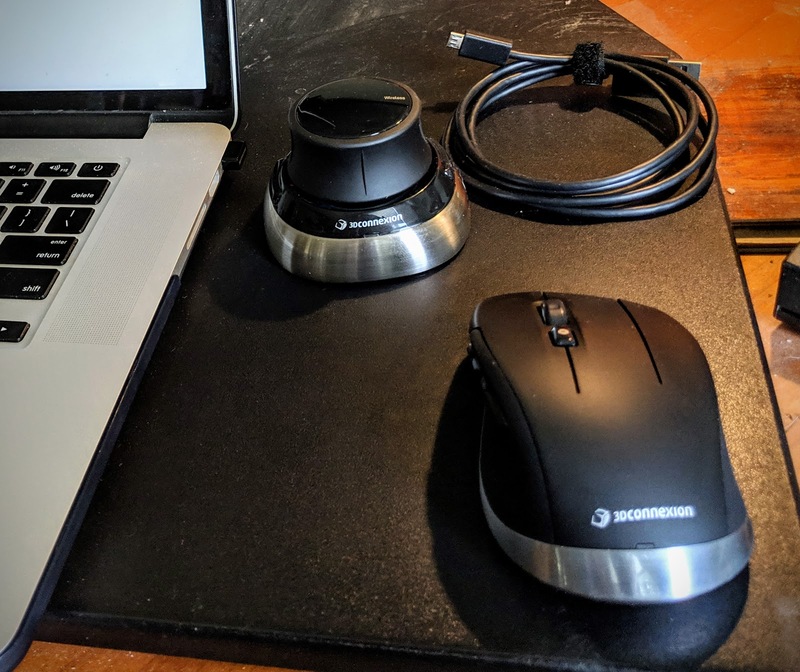 3Dconnexion's SpaceMouse Wireless Kit (3DX-700067) consists of a SpaceMouse Wireless (3DX-700066), a CadMouse Wireless (3DX-700062), a mousepad, a 2.4GHz USB dongle, a micro-USB cable plus carrying cases for the SpaceMouse and CadMouse. The bundled price is $199 list which saves you $49 off the price of the individual SpaceMouse Wireless ($149 list) and the CadMouse Wireless ($99 list). These products support both Macs and Windows PCs. And application specific configurations are provided for a wide range of CAD and media software. I am limiting my comments to my direct experience using these products with a MacBook Pro Retina 15 (late 2013) running High Sierra (MacOS 10.13) and CAD use in Fusion 360. As I mentioned in the SPOILER, the CadMouse Wireless is the success here. I have tried to use every mouse I could find with Fusion 360. Some, like Apple's mice are complete non-starters. Apple's mice lack the middle mouse button feature that is required to control Fusion 360. Apple's trackpad works almost satisfactorily -- orbit requires use of the shift key, but the latency before the pinch-gesture-based zoom kicks in bumps it out of the completely satisfactory category. Let's just say it works in a pinch. The classic Microsoft mouse with a clickable scroll wheel is the canonical mouse for CAD, but I've run in to a lot of differences in the sensitivity and granularity of the scroll wheel on these mice and similar models. I've also found that some mice work better than others with Macs, and that USB activity often causes mice to be glitchy. I've had the best results with USB-dongle-based mice. The 3Dconnexion CadMouse Wireless requires that you install their latest drivers before it will work properly. (i.e. it is not a plug-and-play substitute for a Microsoft mouse.) This is an unnecessarily complicated process requiring downloading and installing the drivers, enabling permission for the System Kernel Extension and a couple reboots. (Just keep trying until it works.) Once installed I found the latest drivers work quite well. There is no printed manual, no PDF manual, and the 3Dconnection website has very limited help available, but there is a Help app that gets installed with the drivers. This is a bit of putting first things second, and hopefully you won't have trouble before you get the software installed. The Help app is useful to explain the software configuration preferences such as the "Dominant" setting. The CadMouse Wireless can be connected to the Mac either by the included 2.4GHz USB-dongle, Bluetooth or micro-USB. The supplied micro-USB cable is required to charge the Lithium Ion battery in the CadMouse. (It is supposed to last 2 months between charges, and battery life is indicated on the preference panel.) Both the USB-dongle and the micro-USB cable will require USB-C adapters for USB-C-only computers such as newer MacBooks and MacBook Pros. There is a switch on the bottom of the mouse to turn the CadMouse on and off. There are also buttons on the bottom for pairing and choosing between Bluetooth and dongle mode. The CadMouse is only shaped for right-hand use. There does not seem to be a left-handed option available. The CadMouse will wake from screensaver, but it doesn't wake the Mac from sleep, but that might be a configuration option somewhere. That setup is OK by me. I can orbit a model from any orientation to my desired orientation intuitively and directly. That brings us to the other part of the kit -- the SpaceMouse, a novel device. The SpaceMouse Wireless is one of a handful of SpaceMouse product configurations. The other versions of the SpaceMouse are larger, wired or add more buttons. The core of the SpaceMouse products is a knob that sort of resembles a pommel on a horse's saddle. Its function is to allow you to intuitively manipulate objects and views in 3D space. It implements 6 degrees of motion with springy movements of the pommel -- push-pull to zoom, left-right pan, up-down pan, twist to spin around the vertical axis, tilt to tumble horizontally end-over-end, and barrel roll spin. The 3Dconnexion SpaceMouse preferences on Mac allow a lot of fine tuning. You can enable a mode called "Dominant". This essential mode decouples the degrees of freedom such that once you start motion in one mode it mostly stays in that degree of motion. There are also adjustments for threshold and speed for each direction of each degree. By default the SpaceMouse is way too sensitive -- speed is set to 4 on a scale of 8 for each direction mode. I've lowered the speed down for each mode. But even with all the fine adjustments that are available, SpaceMouse is still difficult to control precisely. Too often I find myself tumbling off into space like an out-of-control pod in 2001:A Space Odyssey. When you hold an object in your hand you don't have 6 unconstrained degrees of freedom. Your wrist joints, fingers and body have limits and preferred motions, and motion is always directly controlled. With the SpaceMouse motion is initiated by indicating a mode of motion and an acceleration with a springy nudge of the pommel. In general I prefer the Constrained Orbit mode in Fusion 360 which allows rotation in only 2 degrees rather than 3 -- there is no barrel roll spin. Fusion's Free Orbit adds back barrel roll, plus it blends the other two rotation modes. For me that often leads to more of the same sort of tumbling. The normal setup for the SpaceMouse is to control it with your non-dominant hand -- left for me. Unlike the CadMouse, the SpaceMouse is suited for left or right-handed users. Your dominant hand controls the mouse pointer either with a mouse like the CadMouse or a trackpad. But trying to control the SpaceMouse with your non-dominant hand makes the issues of sensitivity even worse. And you can't practically use the SpaceMouse as your only pointer. There are also two buttons on the SpaceMouse. I have mapped them both to Fit View. I would map the second to Home, but I have not figured out a way to do that in Fusion 360 (there is no macro or shortcut key for Home). The SpaceMouse has its own preferences on the Mac. These preferences can be global or application specific. The SpaceMouse Wireless uses a 2.4GHz USB dongle or a USB cable to communicate with computer. If you have a newer computer with only USB-C ports you will need an adapter. Unlike the CadMouse Wireless, the SpaceMouse Wireless cannot use Bluetooth. Like the CadMouse Wireless, the SpaceMouse has a built-in rechargeable Lithium Ion battery that is recharged via a supplied micro-USB cable. The battery level is reported in the preference panel. They claim the charge will last one month. The SpaceMouse can be switched on and off with a manual switch at the back. I never find myself grabbing for the SpaceMouse to manipulate objects nor to adjust the view in Fusion 360. It may grow on me, but so far my intuition is rejecting the SpaceMouse.